In Japan, the trademark renewal period is six months before the end of each ten-year period after the date of trademark registration. This article explains when the renewal period starts and ends in Japan, and what happens if you fail to renew your trademark right during the renewal period. The first thing you need to do is to check the date of trademark registration in Japan. When your trademark is registered in Japan, you receive sheet(s) of hard paper certificate called a "certificate of trademark registration". Registration Date is indicated on the certificate in Japanese and English. If you can not find the paper certificate of trademark registration, no problem. Please feel free to let us know. We can check it for you free of charges. Trademark right is valid for 10 years in Japan. Trademark right is valid for 10 years from the date of registration, and will expire on its 10th year anniversary. Yet, by filing a request for renewal of a trademark registration, the trademark right can be renewed for other 10 years. For example, if a trademark is registered on October 24, 2008, the trademark right will expire on October 24, 2018, unless a request for renewal of the trademark right is filed along with a payment of renewal fee. The first expiration date is October 24, 2018, which is the 10th year anniversary of the trademark right. And, the second expiration date will be October 24, 2028, which is the 20th year anniversary of the trademark right. The third expiration date will be October 24, 2038, which is the 30th year anniversary of the trademark right. When can I renew my trademark right? The above figure shows when a trademark right can be renewed in Japan. Let's say the trademark is registered on October 24, 2008. The trademark right will expire on October 24, 2018. If the trademark is in use in connection with the goods and/or services protected under the trademark right, the owner of the trademark right can file a request for renewal of the trademark right and pay the renewal fee within the renewal period. Renewal period is 6 months before the expiration date. In the example above, the renewal period starts on April 25, 2018 and ends on October 24, 2018. Even when you fail to complete a renewal request on or before its expiration date, the trademark right can still be renewed within 6 months from the expiration date, with an additional fee. In the example above, the renewal period ends on the expiration date, i.e. October 24, 2018, and the grace period starts on the next day, i.e. October 25, 2018 and ends on April 24, 2019. So, how much is the additional fee for late renewal? The official fee for renewing a trademark right within the six-month grace period is DOUBLE the renewal fee. Regular renewal fee is JPY 38,800 per Class. 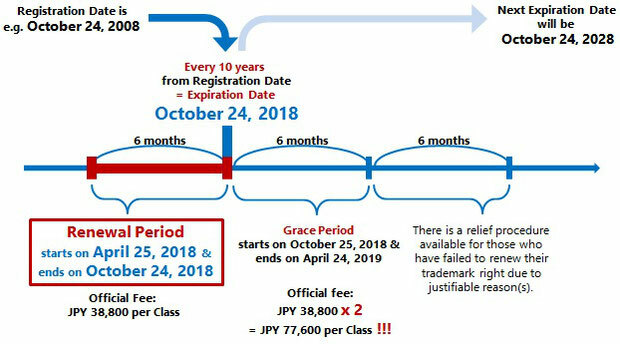 The fee for renewing a trademark right within the grace period is JPY 77,600 per Class! If no request for renewal of a trademark right is filed within the six-month grace period, the trademark right is deemed to have expired retroactively as of the original expiration date. After the grace period, is there any way I could renew my Japanese trademark right? It is possible only when you have a justifiable reason why you fail to request a renewal of the trademark right within the six-month grace period. If the Japan Patent Office finds the justifiable reason to be reasonable, your trademark right, which is deemed to have expired, will be restored. If you do have such justifiable reason, you need to submit a document called a "Statement of Reasons for Restoration" indicating the justifiable reason, in addition to a request for renewal and payment of the late renewal fee (double the regular renewal fee). The time limit allowed to request a renewal with such reason is within two months after the date on which the justifiable reason has ceased to exist and within six months after the six-month grace period. Don't forget to make a payment for trademark renewal within the renewal period. Those who are not resident in Japan are required to appoint a representative to handle trademark proceedings as your trademark administrator in Japan. It means that normally speaking, you don't have to worry about the timing of the renewal period of your trademark right(s) since you have an appointed representative who have handled your trademark registration process, etc. Your Japanese representatives will normally send you reminders once the renewal period arrives. Nevertheless, it is a good idea to mark the expiration date of your trademark rights on your calendar and set an alarm function on so that you will receive computer-generated notifications from the calendar, just in case. Please note that the Japan Patent Office doesn't send out any notifications or reminders in relation to renewal. If you notify us of the registration number of your trademark right, we will be more than happy to remind you of the arrival of the renewal period, free of charge. The renewal fee can be paid in two installments. When should the first installment payment be made? The renewal period and grace period for the first five-year installment are the same as those for ten-year lump sum payment as detailed above. When should the second installment payment be made? The second renewal fee for the remaining five years should be paid within five years from the registration date or previous expiration date. or within the grace period, which starts October 25 2023 and ends April 24, 2024, with an additional fee.